It’s no secret that ballet dancers are under intense pressure to maintain a low body weight — but a teen ballerina is challenging the dance world’s body standards, and she’s eager to share the message that no one should let their body type stop them from doing what they love. Two months ago, 15-year-old Lizzy Howell posted a video of herself in ballet class executing a seriously impressive turn sequence. Over the past few days, the video has gone viral and it’s been widely shared on social media by people who are inspired by the teen’s dance skills and her devotion to the art despite not having what’s considered the “ideal” body type for a ballerina. “If I can do everything that anyone else can, why should I be in a separate category?” she told BuzzFeed News. The teen is excited that she’s been discovered because social media provides the opportunity to introduce body diversity in dance to people all over the world. There’s another reason Howell is grateful that she’s gone viral — she can now raise awareness for pseudotumor cerebri, a condition that causes pressure increases in the skull for no known reason. Dance has helped her cope with the illness and the anxiety it causes. In the days since the video went viral, Howell has rapidly gained Instagram followers and over 43,000 people are now following her account. 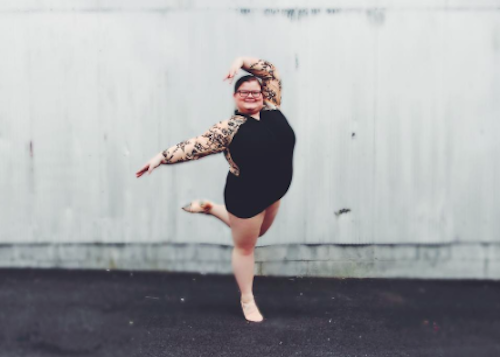 She’s an inspiration to young dancers and anyone who’s ever had second thoughts about pursuing a passion because of their body type — plus, it’s a joy to look at her dance photos.